CarShop, a used car retailer and MG franchise, has been accredited with the Investors in People Silver standard. CarShop created a movement designed to give every single colleague in the business the best chance for progression and success in order to gain the Investor in People accreditation. The company put a “skills framework” in place and introduced a new “development journey” plan in place for employees. This work also included putting focus groups together within the business to look at improving communication, reviewing pay and benefits. Neville Rowles, CarShop head of people, said: “Our people are our lifeblood. “They shape our strategy, define our brand and deliver on every level. With the industry and world changing so much we need to ensure we have the right people to keep us ahead of the game, and I believe this accreditation is a testament to the fact we’ve been doing a great job so far, and will continue to do so going forward. 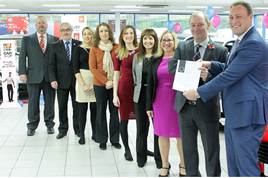 A recent colleague survey carried out by CarShop showed that over 90% of its workforce were satisfied. The accreditation has also been timed well with the appointment of a new talent acquisition manager and a new careers section to the group’s website.